Over the past few years researchers at Met Éireann have produced a climate reanalysis dataset, called MÉRA – Met Éireann Reanalysis, for the period 1981-2017 for an area covering Ireland, the UK and northern France. Climate reanalyses give a numerical description of the recent climate and are produced by combining models with weather observations. They contain estimates of atmospheric parameters such as air temperature, pressure and wind at different heights above the ground, and surface parameters such as precipitation, soil moisture content and temperatures, and sea-surface temperature. The MÉRA dataset was launched in May 2017 and has over 100 users in Ireland, the U.K., Germany, the Netherlands, Canada and the U.S. On May 17th we held the first workshop for users of the data. The workshop consisted of 15 very interesting talks spread across sessions on climate applications, precipitation and hydrology, energy, waves and storms. 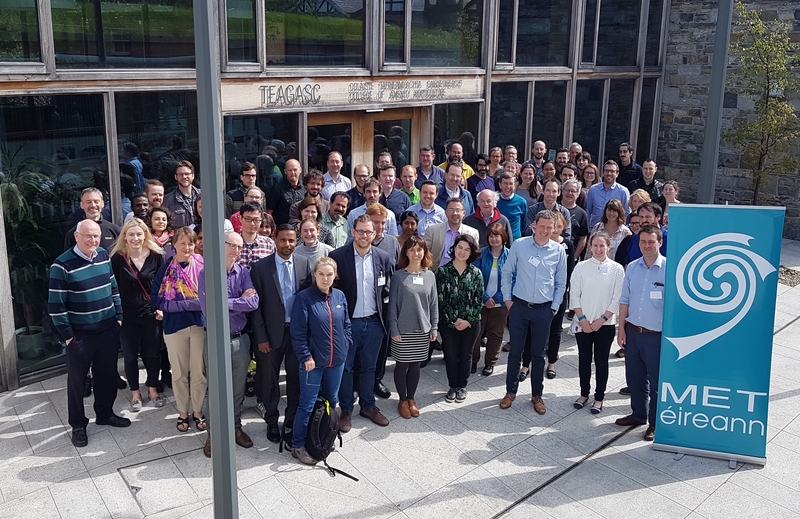 The event was held in the scenically located Teagasc lecture room in the National Botanic Gardens and attracted speakers from Ireland, the U.K., Canada and the Netherlands and an audience of approximately 80 users which led to lively interactive discussions. Some of the delegates at the first MÉRA workshop.